Before you get access to the FREE Law of Attraction Online Course, you need to confirm your subscription RIGHT NOW. Check your inbox for an email from me with the subject line: Please confirm your subscription. – If you are using GMAIL: Please check the Promotional tab or Social tab or Junk folder. – If you are using other Email like Yahoo or Hotmail or any other: Please check your SPAM folder. 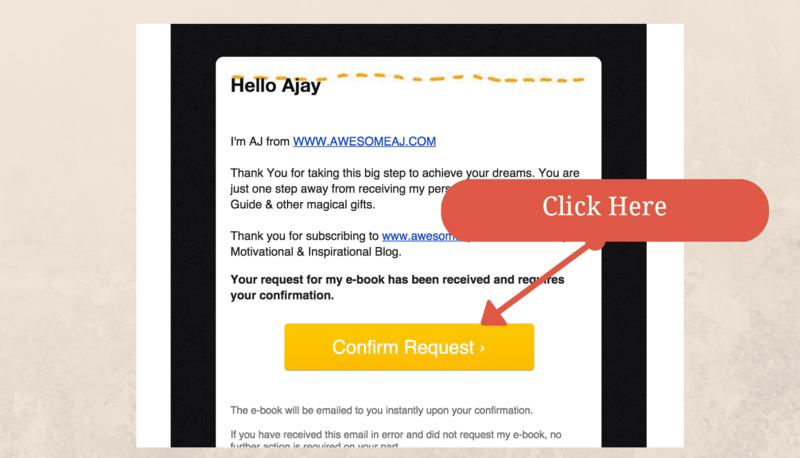 Open the email and click on the Confirm Request button. Awesome! You have successfully completed the process. Now check your inbox for the Free Course. Time to start your journey with Law of Attraction. Please check your email and do confirmation. Yes iam ready now. Iam gonna do best. You Rocks Kshitij.. Tons of success to you. Welcome .. Live your dreams. Sir . I m doing 21 days magical course. Today is 3rd day. But i couldn’t download any day’s course material till now, because sir i didn’t get any link. Plz help sir . .
Priti, please clear the Cache and Cookies from your browser then all the link will work. Your browser has too much cookies or caches the is harmful that is what the links are not working for you. Please clear them and try it will work perfectly. Thanks sir. . But i have tried ,nothing happened. .
Priti, have you click the confirmation button in the email? link.how many sent by you. Start practice gratitude for all the good things and more magic will come to you. After confirmation I have not received any link. Pls help. Please check an email from Awesome AJ. may be in your social or promotional tab. I suffer from lack of self-confidence, and have been trying to get my life back on track after spending the last 10 years in crisis. am all set sir AJ , looking forward to get job before november 15 2017 ,help me out to get my dream job before that date. and i trust u , u can set my my goal done . thank u aj . Yes, we do offer 1-on-1 coaching. Please send an email to aj@awesomeaj.com and we will share the details. I also want to be experienced and get motivated by this cource of law of attraction 7days. Yeah I have successfully taken up the course.. I m unable to receive your confirmation. Sir when will this law of attraction course starts??? Am new to ur page.I feel very lonely and desperated.I want to change my life.I want to make myself happy and my surroundings too.I hope ur advices and speech will change my life. I am confirmed of subscription your seven days manifestation plan but what about free gifts how to achieve that? Yes aj i and my girlfriend joined your free 7 days course today,which will be start from tomorrow morning.i am very much excited to feel the magic pf the universe.